Following my torrent of Sherlock Holmes I was tempted to do a ‘Five to Try’ on the short story collections, picking my favourite story from each. But it’s not as if the Holmes canon doesn’t have enough words dedicated to it already, and thus I thought I’d opt for collections by other authors instead. While I technically popped by blog Carr cherry a few weeks ago in recommending Death-Watch, it was at best a passing thumbs-up to the man and his achievements. And, following the disappointment of my intended novel under review, the time is probably ripe to dive in, get the first Carr review up and prop open the floodgates. And why not The Hollow Man (a.k.a. The Three Coffins)? 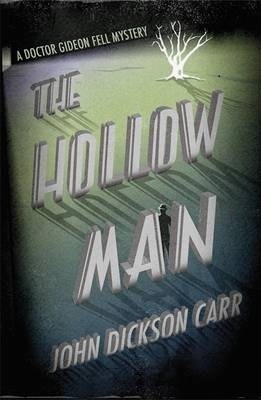 Carr’s most well-known work, an arguable masterpiece of detective and impossible crime fiction, surely the most widely written about impossible crime novel on the internet…why not trot out the usual platitudes, recommend it unreservedly and fill the gap in my schedule? Except, and here’s the different perspective I’m hoping to bring to this, the first time I read The Hollow Man I hated it. I hated it. 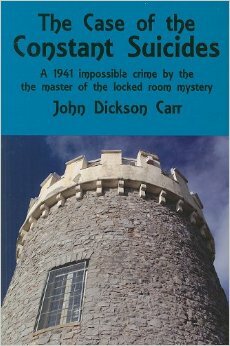 It was published as part of Orion’s Crime Masterworks series and that alone stimulated sufficient interest for me to give it a go but, being in my nonage of classic crime fiction, I couldn’t really tell you what an ‘impossible crime’ was and so didn’t know what to expect. I somehow knew of Carr vaguely (the internet was not quite so well-informed then as now), had ten or so Agatha Christies to my name – including Murder in Mesopotamia, which I failed to recognise for the impossible crime it is – and figured that alone meant I would be in for a similar kind of experience and knew what I was doing. Simple criteria: novels only, readily available, not conceived in the fertile ground of John Dickson Carr’s imagination. I’ve also restricted the impossible crime to being the comission of the murder – people stabbed or shot while alone in a room, effectively – more to help reduce the possible contenders than anything else. Several stone cold classics are absent through the inclusion of other invisible events but that’s a future list (or five…). So I love my classic crime, we’ve established that, but where does this leave you? After all, having someone go on about themselves all the time gets a bit boring. You’re always saying that, aren’t you? Sensible person that you are. So, just for you – yes, you – here’s a list of five books I’d recommend if you’re thinking of getting started reading classsic crime fiction but are a little overwhelmed by all these books by dead authors (I feel the same about classical music, for what it’s worth). 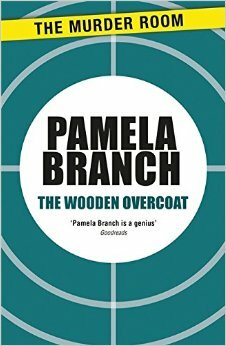 The less you know about Pamela Branch’s debut novel the more you’ll get out of it, and obviously this poses a problem for my nascent blog. A few cultural touchstones, then: it falls somewhere within kicking distance of Alfred Hitchcock’s The Trouble with Harry (1954), 1980s comedy classic (one of those words should be in ironic quotation marks, surely?) Weekend at Bernie’s (1989), and the output of Kelley Roos. There is a dead body. It must be hidden. Difficulties ensue. And this undertaking (if you will) is very, very funny. The funny is a difficult one, because I’m honestly not sure at which point it becomes funny. It starts off strange and becomes only stranger as it goes, all the while introducing a gentle absurdity that, at least for me, tips over into outright hilarity at times. It’s not consistent rolling-in-the-aisles comical, but I’d be surprised if you could read too much of this – especially in the set-pieces like the ‘picnic’ and, later, its glorious counterpoint in chapter 18 – without at least a wry smile on your face. There are a few quite lovely suprises, hence my recommendation that you know as little as possible going in, and it all stays far enough this side of zany, bawdy nonsense to remain just about believable.